Lois has been a dental hygienist since 1977. She attended Northampton Community College in Bethlehem and earned her associate’s degree in dental hygiene in 1977. Lois has been working with Dr. Hunsicker­Morrissey since 1990 and joined the team full­time in 2000. She currently holds a hygiene anesthesia license to administer anesthesia. Lois is also certified in CPR and maintains a membership with the American Dental Hygiene Association. 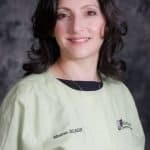 She loves staying up to date with the newest dental technology and translating that information to her patients. Lois lives in Bethlehem with her husband and dog, Bently the bichon. She loves traveling to Europe, gardening, skiing in Colorado, and biking at the beach.